Stainless Steel Shower sign, approx 120mm x 120mm x 1.5mm. Image and text is laser engraved, burning the steel to leave a durable mat black letter. 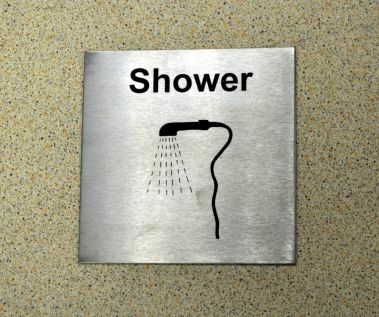 Stainless Steel Shower Signs can be supplied with screws or self-adhesive backing.